On Saturday night, the NFL scheduled a major television event for the marquee game of the first playoff weekend. A rivalry game, with intense feelings between players and cities, featuring one of the great franchises in American sports, the Pittsburgh Steelers. The Steelers at the division-champion Bengals was the most anticipated game of the weekend, and the CBS audience proved it. At the height of the telecast, between 10 and 11 p.m., some 27.5 million people were tuned into the game. The combined TV audience for the other major-network programming at that time was 6.98 million viewers. So, as this game reached its climax, four out of every five major-network viewers were watching the NFL game. It was exactly the magnet the NFL had in mind when they booked this game for prime time. • Pittsburgh linebacker Ryan Shazier ramming Cincinnati running back Gio Bernard with the crown of his helmet, something that year after year, practice after practice, players have been trained and warned not to do. For minutes, Bernard lay motionless on the ground. • Cincinnati running back Jeremy Hill running on the field and trying to fight or somehow challenge four different Steelers while Bernard lay injured. 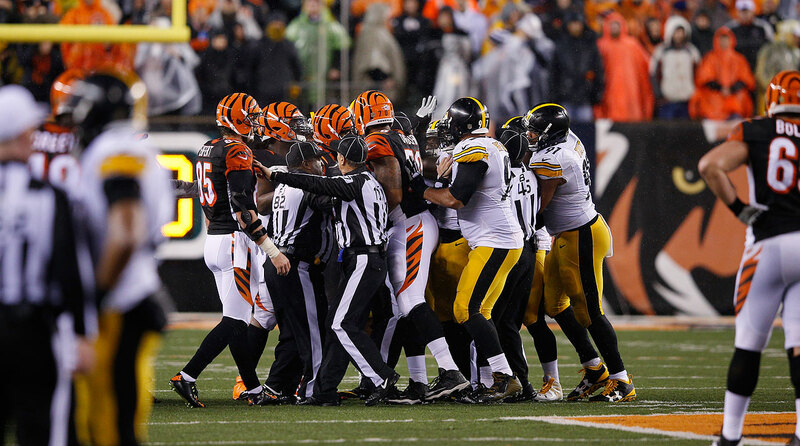 • Cincinnati linebacker Vontaze Burfict sacking Pittsburgh quarterback Ben Roethlisberger. Later, one angle showed Burfict trying to drive a knee into the injured shoulder of Roethlisberger. • Burfict, leading with his shoulder, ramming defenseless Steelers receiver Antonio Brown in the helmet after an exposed Brown reached for a pass, causing Brown’s body to go limp and his head to jerk uncontrollably, the way an unconscious person’s body would react. • Steelers linebacker coach Joey Porter in the middle of the field where he shouldn’t have been (assistant coaches are not allowed on the field during the game) jawing with assorted Bengals until Cincinnati’s Adam Jones burst past an official to challenge Porter. This contact with an official caused Jones to be flagged for an unsportsmanlike conduct penalty, moving Pittsburgh in position for the winning field goal. Porter smiled. One Steeler jumped with glee at the flag. Soon, the Steelers kicked the winner and won 18-16. This is what the Steelers and Bengals showed 27 million Americans about the great game of professional football. Your game. The game your coaches—from youth ball up to the NFL—have taught you to play fairly. This was the lesson from the climax of this playoff game: Stop at nothing to win, even if it means concussing the opposition. Taunt your foes. Hit them with the crown of your helmet. Sneak onto the field to induce them into a penalty. Anything to win the game. Demean yourselves. Shame your former coaches and your parents. Show them if you win the game, it’s all good. All’s fair in love and football. If you haven’t noticed, there’s a tornado on the outside of your profession. Parents who grew up loving the game are agonizing about whether they’ll let their children play football. A movie, “Concussion,” is out, and Will Smith plays a doctor warning America about the long-term, inescapable dangers of the sport. Have you seen it? You should. I’ve seen it twice, and I’d go again. You should know what your football ancestors put up with to play the game, and what many of you face if you continue to play. You know what I was thinking when I watched the disgusting hit of Burfict on Brown? I have no idea what the short-term impact of that hit will be, but I know there’s a good chance the effects will be seen on Brown’s brain when he’s 50 or 60 or 70. Or 40. 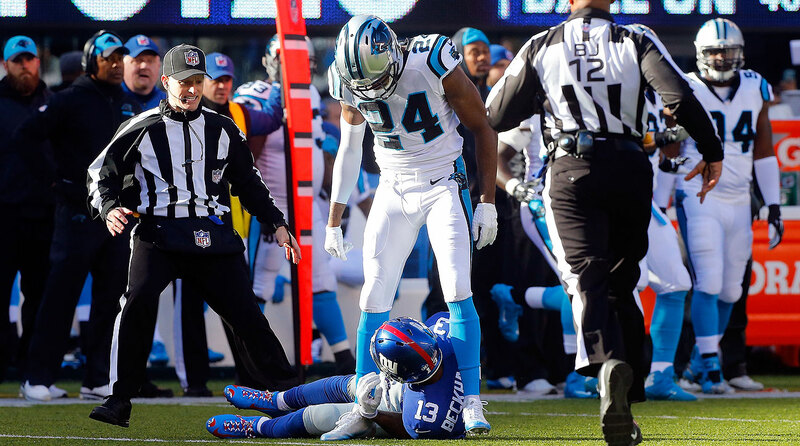 I wondered why, after the ugly and filthy Odell Beckham Jr. hit on Josh Norman a few weeks ago, when Beckham took a running start and battering-rammed his head into Norman’s head, this keep happening. It shouldn’t, but it does. It’s shameful, but it continues. It could someday kill the game, but your peers, few though they may be, keep playing this way. I am writing to issue this plea: Take care of yourselves. Take care of your game. Too many times you don’t look like a family. You look like you want to physically harm the men on the other side of the line. That has to end. Forget about today. Think of all the people who look at games like Steelers-Bengals and say it’s a big reason why football is a dinosaur, and our kids should be playing sports with very little contact. More games like this, and Congress will get involved. And I would be happy if Washington does, because games like that one show you’re not capable of looking out for the common good. I hope you were glad to see the NFL on Monday night suspend Burfict for the first three games of next season. The hit on Brown was part of it. If you didn’t see the bigger reason, you missed Burfict’s incredibly brutal hit on Baltimore rookie Maxx Williams. On the other side of the field, away from the play, Williams went out for a pass and was looking back at the quarterback when Burfict blew up the unsuspecting Williams with a helmet-to-helmet hit that left the Raven prone on the ground. I urge you to just say no to plays like that, to 17-minute periods of game like Saturday night’s. Take control of your game again. You can do a great deal for this game too. To start: Keep the game clean. Insist on playing with honor. That won’t matter with Super Bowl 50. It will matter with Super Bowl 100, though. If football’s still being played.